IDT supply many cameras to the automotive industry for impact testing. There are some features in common with the various applications within the industry, but many different demands too. Here are a few to consider. In general, the industry demand is HD (or near HD) at either 1,000fps for most tests, or 4,000 to 5,000fps for analysing airbag deployments. For full size crash tests and may other applications, the highest resolution possible is demanded. The CrashCam 4010 frames at up to 1000fps at a resolution of 2560×1600 pixels. If you need to mount the camera on board, the cameras would need to withstand the high G-forces produced during the test. Most of our cameras can withstand 200G and the CrashCam Mini range even more. Size and weight also is very important, partly because of the addition to the test itself, but also as it will impact on the size and weight of the camera support bracket/ outrigger etc. 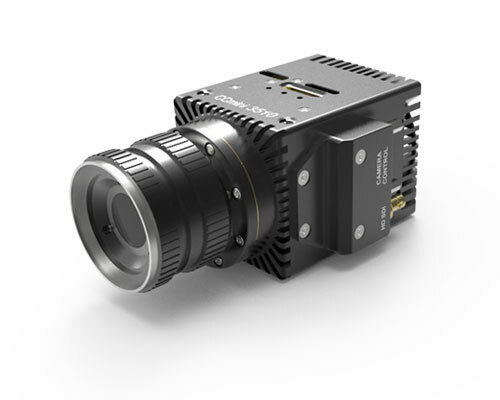 The CrashCam Mini 3510 frames at up to 1000fps at a resolution of 2560×1440 and measures just 44 x 44 x 70mm. With many automotive tests, multiple views are needed. Most of our cameras can be easily networked, with our own hubs, which network trigger, sync and power in addition to Ethernet. It frame sync’ing is required and no cables can be used, some of our cameras can symchronise to GPS timing, so all frames will be sync’d. All our cameras can be run from a battery, and some have built in battery (NX-Air), whilst others have optional backup batteries (Os-series, CrashCam Series, CrashCam Mini Series). In addition to a battery maintaining imagery after recording, some of our cameras (Os-Series, CrashCam Series , CrashCam Mini Series) include a second memory. The non-volatile memory can backup the images to permanent memory straight after the test, so the images are safe as soon as possible. Most tests will not last long, so the standard built in DRAM will be perfectly satisfactory. With most camera models, more DRAM can be specified. For longer recordings, images can directly be recorded to SSD memory (albeit at a more modest frame rate), enabling the ability to record track tests, rollover tests etc. The Os-Series and CrashCam Series offer this. For instance, in streaming mode, the Os7 (with the minimum SSD) can record at 640fps at 1280×720 pixels for over 12 minutes, recording directly to the on board SSD memory. Off board testing. Have a look at the CrashCam 4010, which offers a great resolution at 1000fps. Track testing/ long record time. An Os Series camera, or CrashCam with SSD memory will allow recording for long enough, in addition to being very compact, and vibration proof.